With St. Patrick's Day a week away, a group of my fellow food bloggers and I are taking this opportunity to share some Irish inspired recipes. Now, technically I'm not Irish in the technical sense, if you're going to be all technical about it. But I do live in New York, a giant melting pot of nationalities, religions and cultures. Every year we have a huge St. Patrick's Day parade and our Jewish mayor and Italian governor proudly march. Besides, how technically Irish do you need to be to appreciate delicious food? 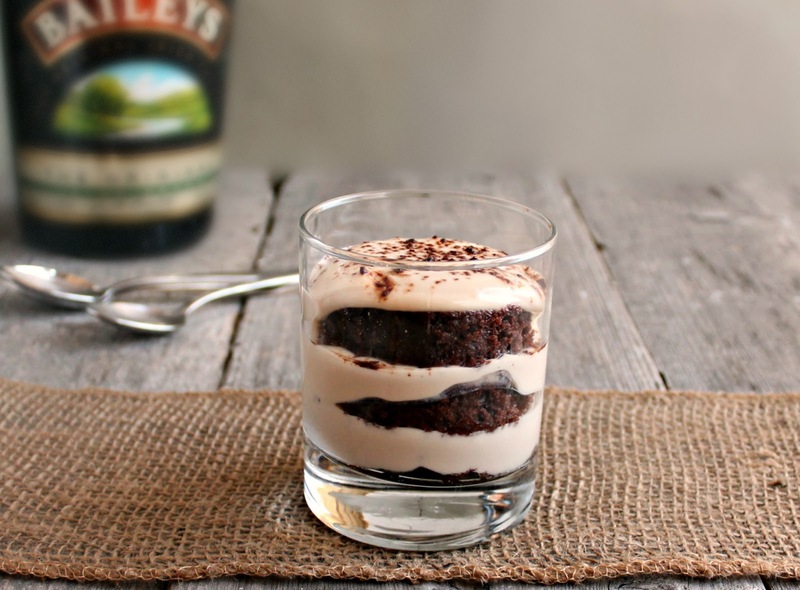 When I started thinking about Irish flavors, my mind immediately went to Bailey's Irish Cream. I've loved it forever but have never tried incorporating it into a dessert. Why, I'll never know because it's fantastic. I knew I didn't want to cook it and risk losing the flavor so I paired it with a no-bake cheesecake filling and threw in some chocolate brownies for good measure. I managed to get the dessert layered in the glasses but it took a strong willpower effort not to just eat the filling with a spoon. Enjoy! To make the brownies, melt the butter and chocolate together in a double boiler or microwave oven and allow to cool. Beat together the eggs, sugar and vanilla until smooth, add in the cooled chocolate / butter mixture and continue to beat until fully incorporated. In a separate bowl, sift together the flour, baking powder, cocoa powder and salt. Add the dry ingredients to the wet and blend until all the flour is incorporated. Line a baking dish with parchment paper or aluminum foil and pour in the batter. Bake in a pre-heated 350 degree oven for 1 hour. To make the Bailey's cream, combine the cream cheese, sugar, milk and Irish Cream in a bowl and stir until all the ingredients are fully incorporated. Assemble each mini trifle by cutting rounds out of the brownies. I used the rim of the trifle glass I was planning to use so that they would fit. Place a layer of brownie at the bottom of your dish, layer on a large spoonful of the cream cheese mixture and repeat for as many layers as you like. Dust the top with a little cocoa powder, if desired. Makes approximately 8 servings. I totally agree that this trifle is a superb way to incorporate Bailey's Irish Cream into a dessert. That plus cream cheese and brownies = a winner! Anita, you are a girl after my own heart. Baileys is one of the few liqueurs I adore. Besides, not cooking this means you can enjoy it sooner! These are just too gorgeous for words! Mini=more for me! This really looks delicious. I seriously love the photos, too! Way to hit it out of the park! Thanks for being part of our St. Patrick's Party! how pretty! I bet it's delicious! Yes! Anita, I like where your head is at because we had the same thought process over this event: St. Patty's Day = booze = Bailey's. Voila! Magic is born. These trifles look gorgeous! 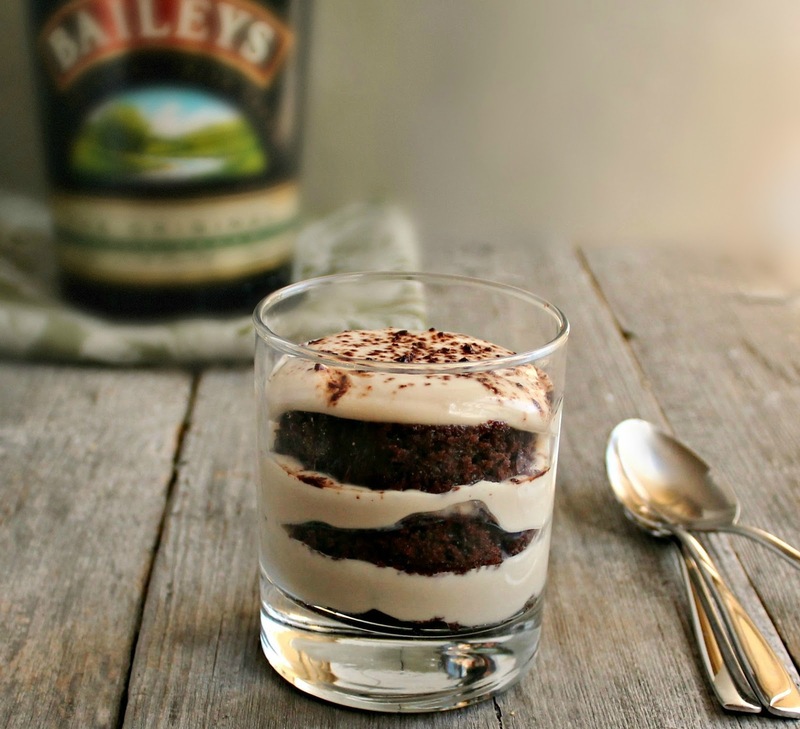 Brownies go well with everything and the Bailey's portion looks so creamy, rich and luscious. Brownies and Bailey's? Yes!!! This has to be one of the best desserts. So have to give this a try! I'm not Irish either, but I do love me some Bailey's! 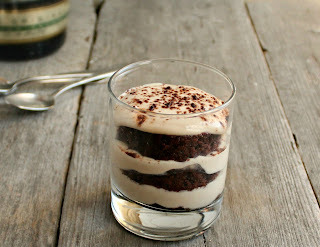 :) Love the idea of working it into a trifle, especially with those brownie layers sandwiched in between. Gorgeous! Bailey's is my favorite liqueur. Your trifles look so good. You can't beat brownies, cheesecake, and Bailey's. I'm married to an Irishman, so St. Patrick's Day is a big day for us! These are super pretty Anita. I love the glass you put it in. Looks so great, I'd definitely eat my share and likely some other peoples as well. I would think of Bailey's right away too. So good just over some ice. I am so happy you didn't do a dyed green treat! This so right up my alley! Looks like we both had Bailey's on the brain today! I love these! Found you through Liz's blog. I love mini sized food and this trifle looks delicious. Perhaps, PERHAPS, this could change my mind about Bailey's. I mean it does look pretty irresistible. These look amazing Anita and Bailey's is one of my absolute favorites! I'm not Irish either, but I love me some Baileys in dessert form! These trifles look amazing, and I think I might have to make them this weekend! Between Elyse's homemade Bailey's and your Bailey's trifle, I think I'm getting the message that I need to make both!!! Pure bliss, Anita! This makes tiramisu look tame! I love it! 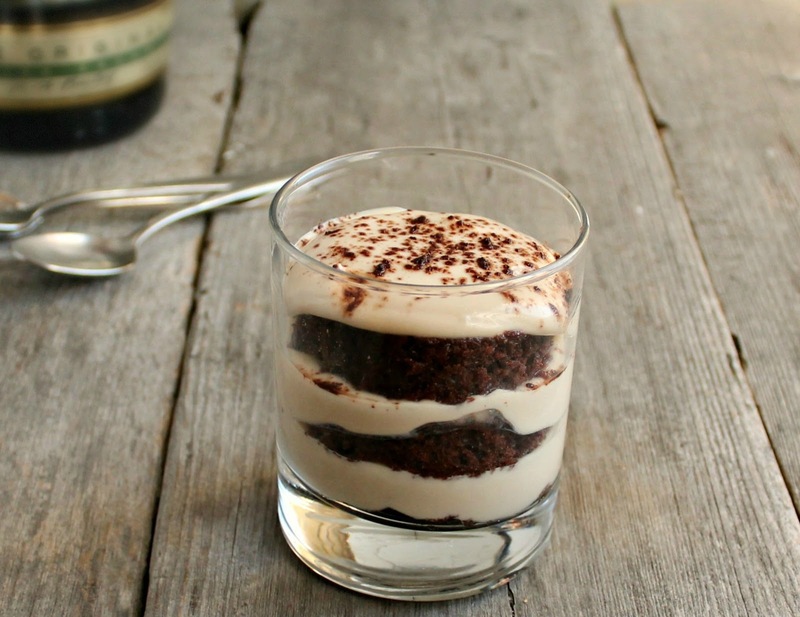 Now this looks like a great treat to celebrate the inner Irish in me :) Love trifles! These are gorgeous! And I love how easy they are to make--I'll have to keep the no-bake cheesecake idea in mind for the next time I need a simple but classy dessert! Oh man. I can only imagine how irresistible the filling is, let alone layer it with fudgy brownies. Pass a spoon and like, 5 of these mini trifles. Thank you for sharing your recipe on Foodie Friends Friday Linky Party. These look delicious! I love you for this recipe. That is all. This is called a perfect article,which has everything.Thanks for share this with us.I just glad to read this and share this awesome post. Types of enzymes at the same time, the lower part of the enzymes produced by the micro flora role prevails. Gastrointestinal motor punktsiamotorika the movement of the digestive system is one of the most important bio x4 functions that the whole process is carried out voluntary, involuntary, macro and .. The treatment for hearing loss depends upon the cause. Your doctor will know what the best remedy should be. Hearing Loss Protocol Review Treatments include using hearing aid devices, removing a build-up of ear wax or prescribing medicine to treat an ear infection. Most people want to know if hearing loss can be prevented. In most cases, yes, it can! You can prevent hearing loss by avoiding exposure to high volume noise such as music, instruments and machines or when such exposure is unavoidable, by wearing hearing protection devices such as ear plugs.